Plant productivity is greatly influenced by various environmental stresses, such as high salinity and drought. Earlier, we reported the isolation of topoisomerase 6 homologs from rice and showed that over expression of OsTOP6A3 and OsTOP6B confers abiotic stress tolerance in transgenic Arabidopsis plants. In this study, we have assessed the function of nuclear-localized topoisomerase 6 subunit A homolog, OsTOP6A1, in transgenic Arabidopsis plants. The over expression of OsTOP6A1 in transgenic Arabidopsis plants driven by cauliflower mosaic virus-35S promoter resulted in pleiotropic effects on plant growth and development. The transgenic Arabidopsis plants showed reduced sensitivity to stress hormone, abscisic acid (ABA), and tolerance to high salinity and dehydration at the seed germination; seedling and adult stages as reflected by the percentage of germination, fresh weight of seedlings and leaf senescence assay, respectively. 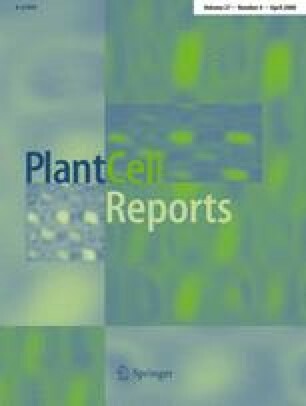 Concomitantly, the expression of many stress-responsive genes was enhanced under various stress conditions in transgenic Arabidopsis plants. Moreover, microarray analysis revealed that the expression of a large number of genes involved in various processes of plant growth and development and stress responses was altered in transgenic plants. Although AtSPO11-1, the homolog of OsTOP6A1 in Arabidopsis, has been implicated in meiotic recombination; the present study demonstrates possible additional role of OsTOP6A1 and provides an effective tool for engineering crop plants for tolerance to different environmental stresses. The online version of this article (doi: 10.1007/s00299-007-0491-8) contains supplementary material, which is available to authorized users. This work was supported financially by the Department of Biotechnology, Government of India, and the University Grants Commission, New Delhi. The award of Senior Research Fellowship to MJ from the Council of Scientific and Industrial Research is gratefully acknowledged.